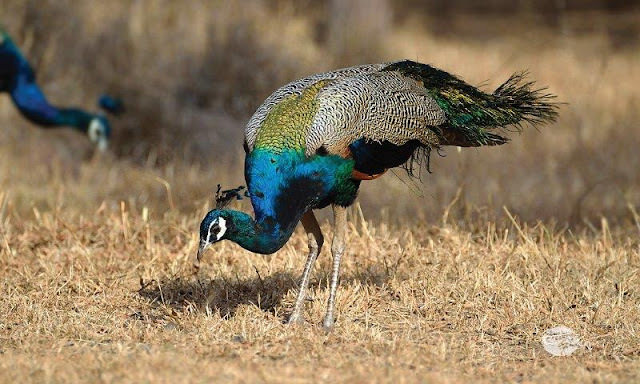 While Hampi is predominantly known for its glorious ruins, and rightly so, I was equally impressed with the sheer variety of avian species this region harboured. 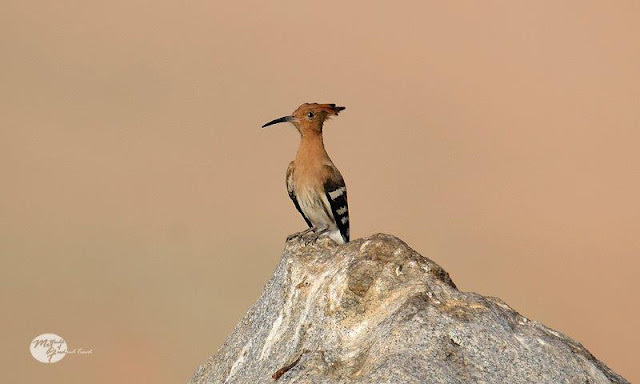 Its stark, arid, boulder-strewn landscape hid amidst itself some of the most beautiful and colourful birds that I had come across. 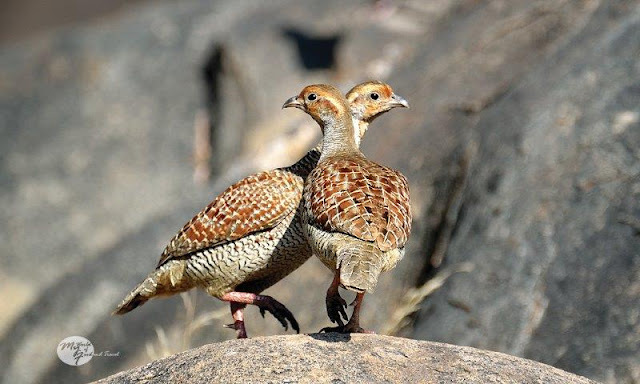 Of course, it is difficult to observe them from close quarters unless you have Pompayya Malemath guiding you. Plain, flat grounds that we had passed by in our previous visit suddenly yielded families of the reclusive sandgrouses. Rock faces that we believed we had scoured minutely, not leaving out any living being, suddenly sprung to life and there stared at us from those very rocks the magnificent rock eagle owl. In Hampi, you never know what you are looking at, till you acquire the eyes of an expert, thanks to Pompayya Sir. 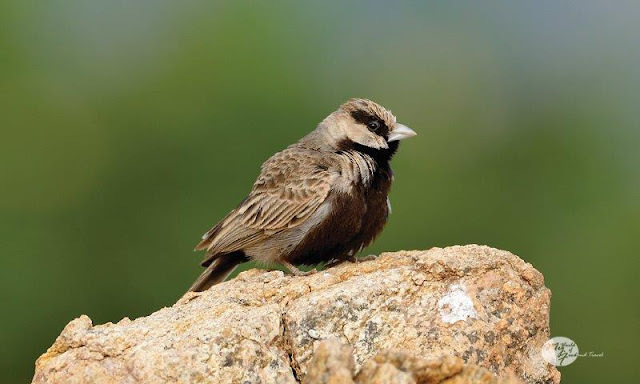 The first bird I had seen in Hampi was still groggy with sleep. It lay perched in its cozy nook, in the crevices of a ruin in the Vittala Temple premises, eyes shut tight and quite oblivious to the rain and chattering squirrels around him. The tiny spotted owlet brought out the birder in me amongst the historical ruins and soon I began to notice more of them, ensconced in little alcoves. It was a rainy day and perhaps that’s what had kept them ‘indoors’. On our next visit, which was in end-December with the sun glaring down at us, none of them were in sight. Instead we were met with the raucous cries of the rose-ringed and the plum-headed parakeets. 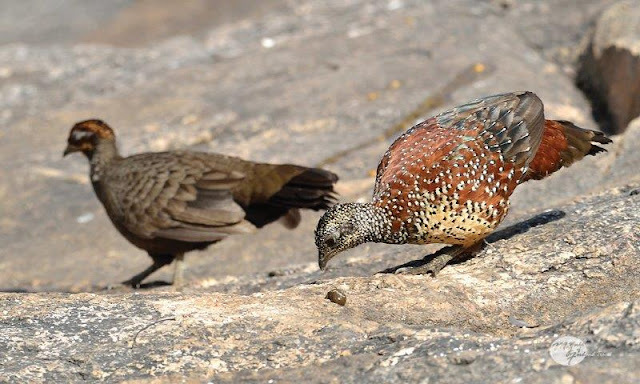 Peacocks cried out now and then, their silhouettes standing out atop distant boulders. Blue-faced malkohas sat boldly in plain sight, not clambering amongst thickets, as per their usual behaviour. After coming back from my first visit, I had sat down to plan out my next trip and listed down the birds I wanted to see. 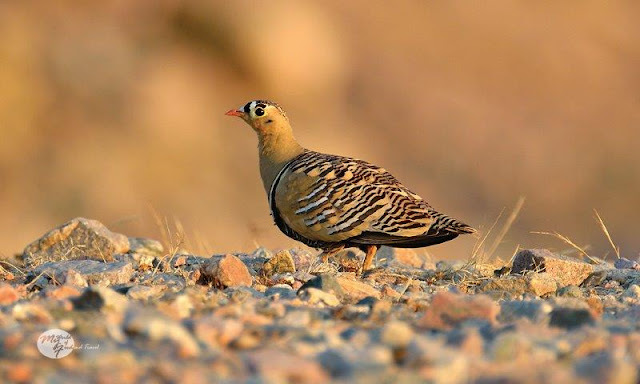 My wish list had just five birds – the Indian eagle owl aka rock eagle owl, chestnut bellied sandgrouse, painted sandgrouse, painted spurfowl and the rare yellow throated bulbul. I came back sighting much more. I have an undying fascination for owls and the first thing I remember asking Pompayya Sir was if I would be able to see the famed rock eagle owls of Hampi. We had narrowly missed seeing the owl on the first visit when it had suddenly taken flight, leaving us with just a glimpse of his flying demeanor. Pompayya had laughed, saying “Let’s tick it off your list first, then.” And he kept his words. 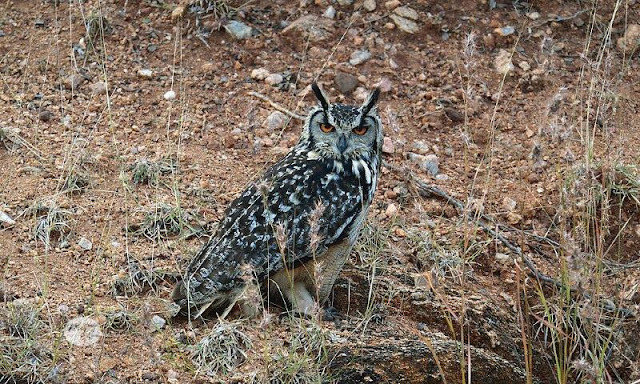 Much as I took pride on being able to locate birds easily, I almost failed to spot the rock eagle owl, so well he was camouflaged in his surroundings. His eyes were half-closed, adopting the stance of a wise old sage. We waited for him to come out of his stupor. Finally, with the rays of dawn touching the rock faces around him, he opened his eyes and there lay before us in all his glory the famous red-eyed rock eagle owl of Hampi. I was dismayed to know that it was these beautiful eyes that brought these magnificent birds to their death. 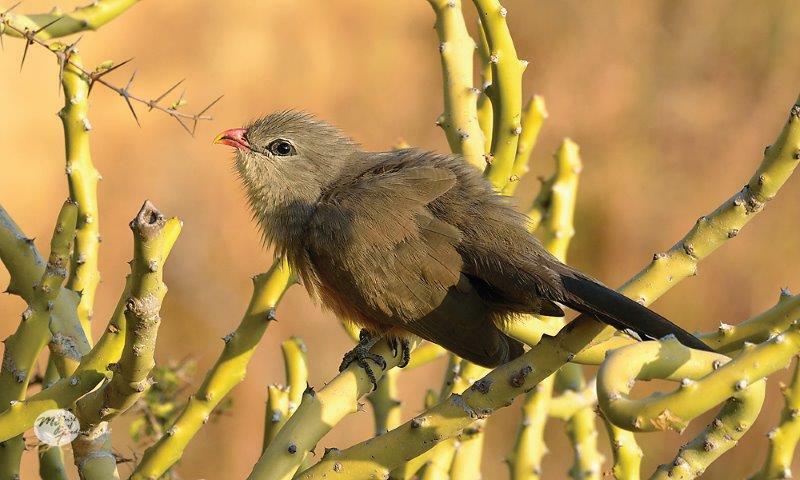 Local populace considered these birds as harbingers of ill omen, owing to their crimson red eyes, and killed them when spotted. We came across several of these majestic owls during the course of the morning, including a juvenile specimen and a nesting parent, and each time Pompayya Sir took care to see that nobody else saw the birds or their nesting sites. It pained me to see the critical condition of these birds. 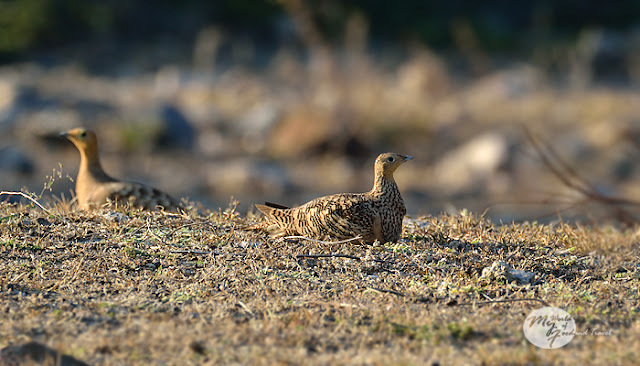 The second bird to get ticked off my list was the chestnut bellied sandgrouse. While the husband had seen them previously in Maidenahalli blackbuck sanctuary, I had not. We were passing by a hedged field, dotted with bushy undergrowth, when Pompayya Sir suddenly asked us to halt our car. 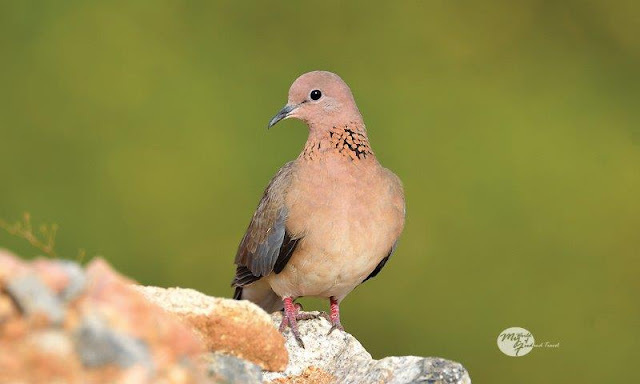 What bird will reside here in plain sight, I asked myself as I followed him. A little later, he quietly motioned towards a small mound and try as I might I could not make out anything. It seemed to be a perfect patch of ground with yellowing grass. Then, suddenly a slight movement, the ground seemed to move and I saw my first chestnut bellied sandgrouse. 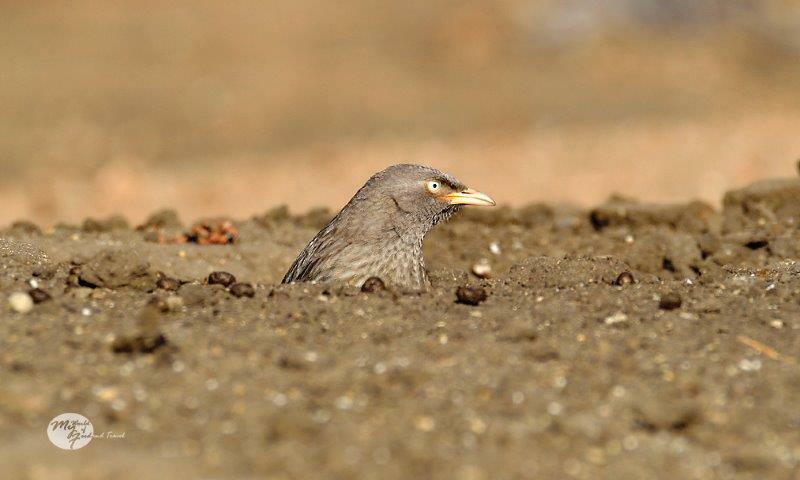 We saw them several times during our birding sessions and each time they amazed us with their clever camouflage. In the meantime, we also paid a visit to Daroji bear sanctuary (see part 1) to see the sloth bears and in the bargain, got acquainted with the painted spurfowls as well. 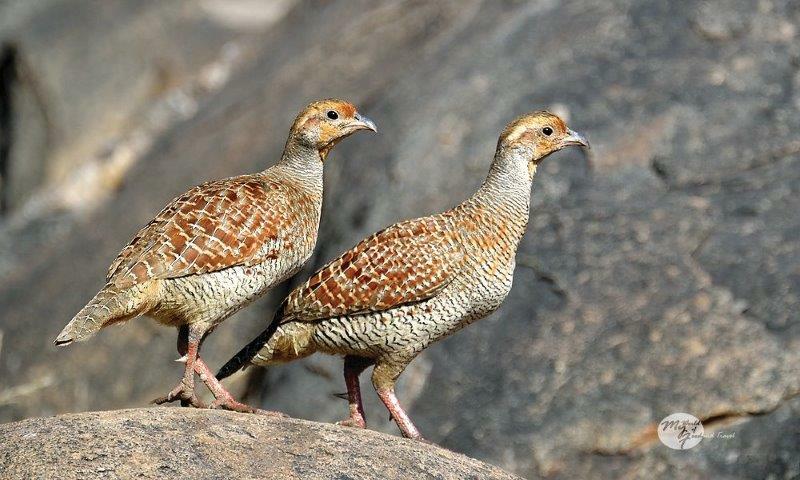 Unlike the grey francolins, who were bold enough to venture out of their hiding places sooner, the spurfowls were much more shy and skittish. Finally, with the francolins pecking away furiously at the food, the spurfowls decided to claim their fair share as well. 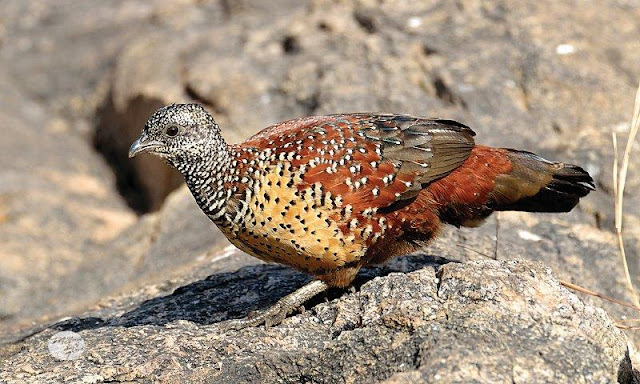 Soon, the hillocks where the sloth bears were scheduled to make their appearances were choc-a-bloc with grey francolins, painted spurfowls, jungle babblers, jungle bush quails and peacocks. It was a party on the rocks! 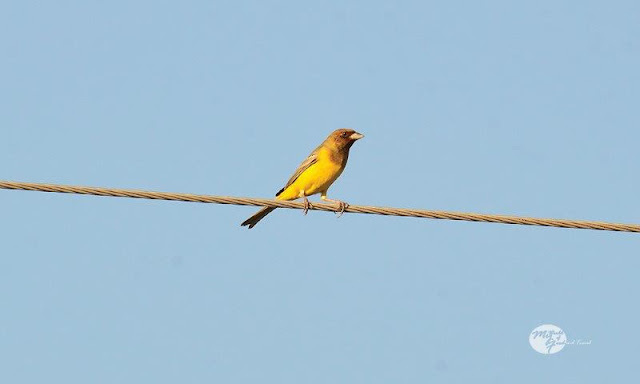 As we drove around Hampi and Daroji looking for birds, I realised that one of the reasons behind this region supporting such diverse species of birds was its geography. The landscape varied from outright rocky to intermittent flat plains to thorny scrub lands, coupled with agricultural fields and a canal running through the entire region. Each of these areas housed their own stash of bird life. For instance, the canal area and the adjoining agricultural fields had a number of woolly necked storks and red headed buntings, while the yellow throated bulbul could be found only in the hills opposite the Virupaksha Temple. It was while driving along the different pathways, guided by Pompayya Sir, that we came across the exquisitely gorgeous painted sandgrouse. Unlike its cousin, the chestnut bellied, these birds were more colourful and were marked out with a beautiful ‘necklace’ around its neck. They were also bolder and more photo-friendly as they stood rooted to the spot, allowing us to marvel at it for quite some time. Unfortunately, they also made easy prey for raptors and poachers alike. We met more of them on our way back from Pompayya Sir’s property, a place he had single handedly made green by planting numerous tree saplings. 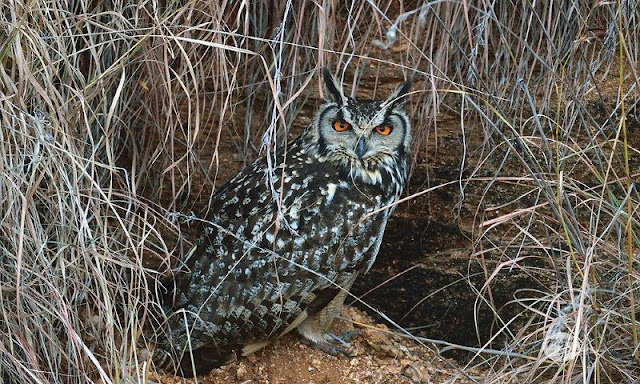 It was dark and a number of birds were caught in the car’s headlight, including spotted owlets and nightjars. 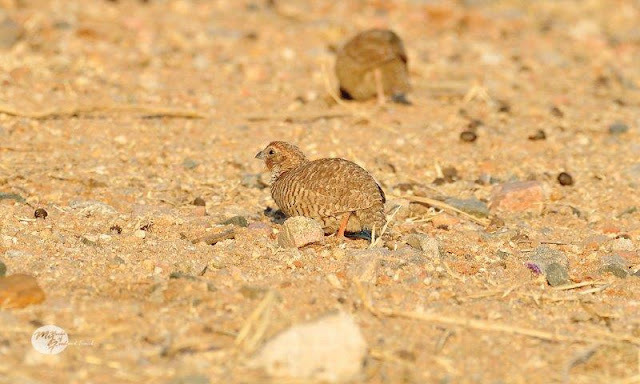 While the other birds flew away on approach, the painted sandgrouses stubbornly ‘sat down’ and refused to budge. While this defense mechanism would work in the daylight, allowing them to be merged into the rocky, yellowed background, it was a different story at night. Thankfully, conservationists like Pompayya are around to deter such mishaps. 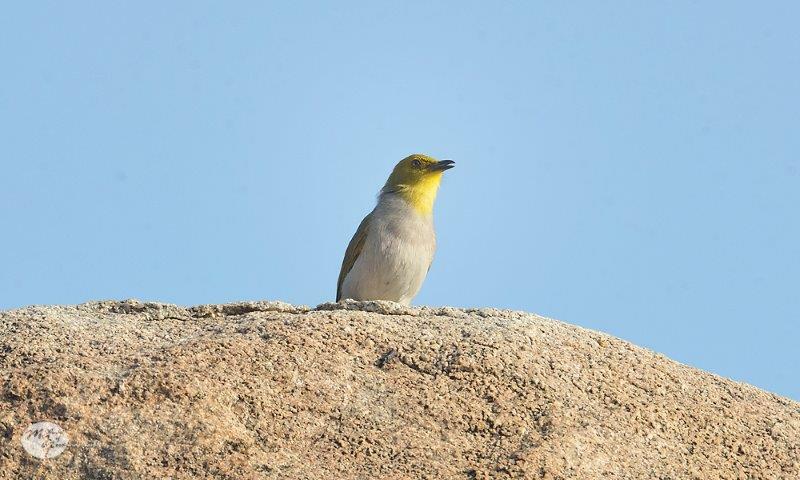 By the end of our stay, I had only one bird left to be ticked – the endangered yellow throated bulbul. Pompayya Sir had kept the best till the last. 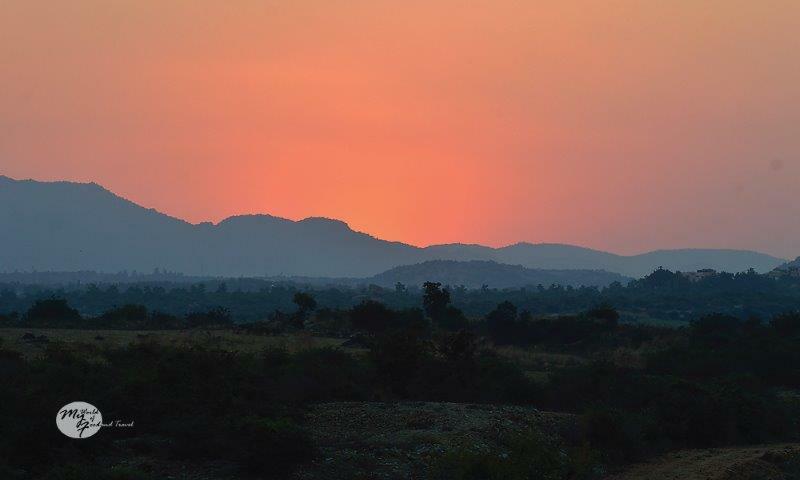 And so, on the last day of our stay, we woke up at 4.30 am to climb up the stairs leading to the hillocks opposite the Virupaksha Temple. 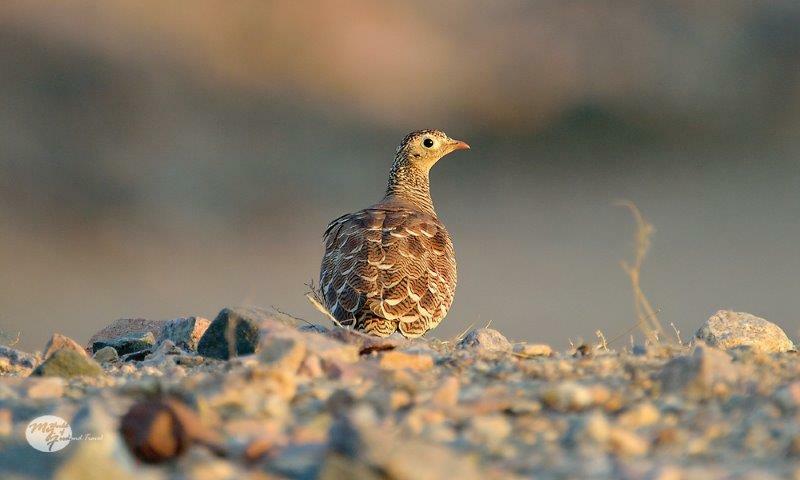 The rare birds were quite temperamental and could be sighted only in the early hours of the morning. On the way, Pompayya pointed to us sloth bear scats. Apparently, bears would visit the area late at night to lick off the oil from lamps lit in small alcoves with deities. As dawn broke over, it felt surreal to be standing there overlooking the ancient temple and the ruins around it – the horse traders market, the performing arts lanes…..it almost seemed in the darkness as if the city would come alive along with the first rays of the sun. A lovely twitter reached our ears as the sun strove to break through the dark clouds. 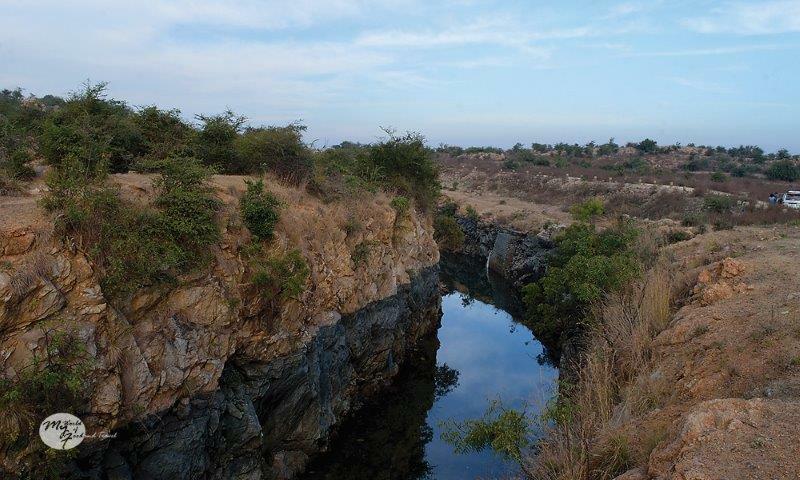 “The bulbul..” Pompayya sir pointed towards the little, restless birds flitting around the rocks. It was difficult to take a clear shot of the fidgety bulbuls and soon the twitters could up heard uphill. The husband began climbing up while I decided not to try anything adventurous. I spied a verditer flycatcher and was photographing it when I saw Pompayya and a Manipuri couple (I thought they were Japanese, just as some people thought me to be Chinese) chatting excitedly pointing towards a thorny plant. 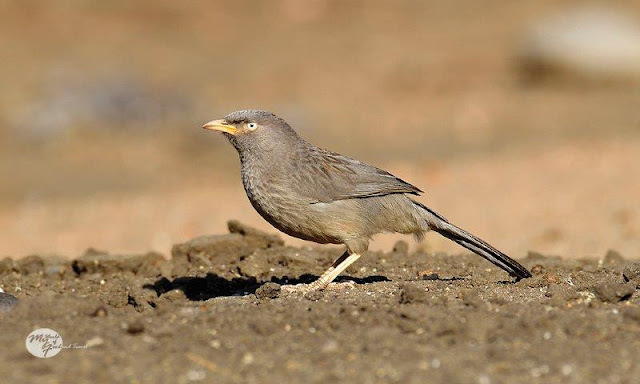 I followed their gaze and saw a sirkeer malkoha posing away unmindfully, in a manner quite contrary to its general skulking behaviour. “Bonus bird!” Pompayya exclaimed happily. Later, as I stood on the side of a huge boulder, looking down upon the brilliant scenery, a soft sound behind me caught my attention. 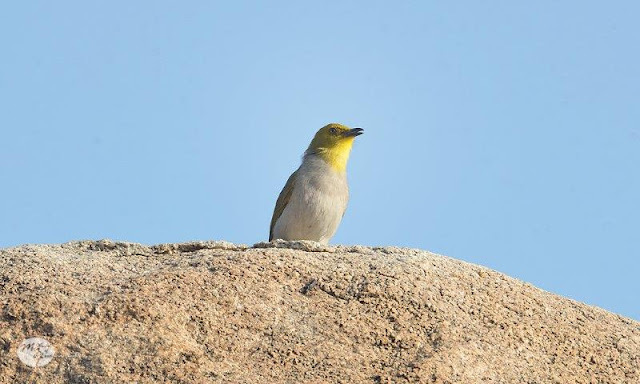 I turned around and there was my fifth most wished for bird – the yellow throated bulbul, within touching distance, looking at me. A year back I was in Ooty, wanting to see a black and orange flycatcher and it had appeared before me, in the same manner, within the same touching distance. Sometimes, I believe, the birds choose me. 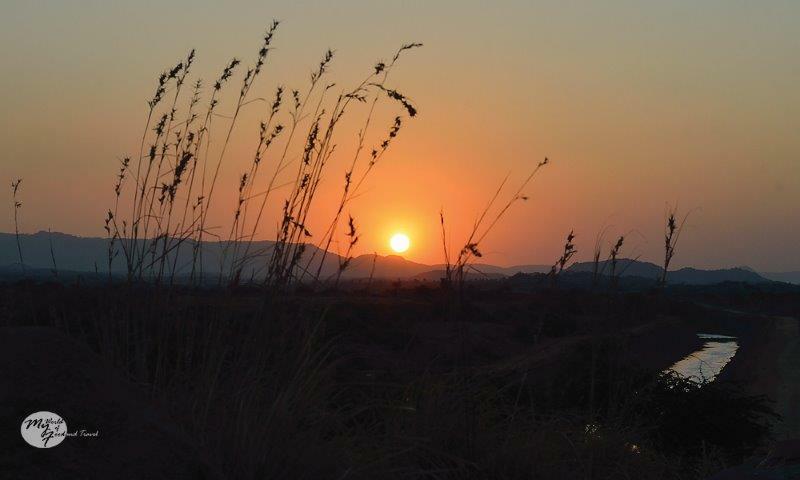 My wish list was complete - Hampi had given me all that I had wished for. For this reason and for the many beautiful experiences that I had here, this birding trip would always remain among the special ones in my memory. 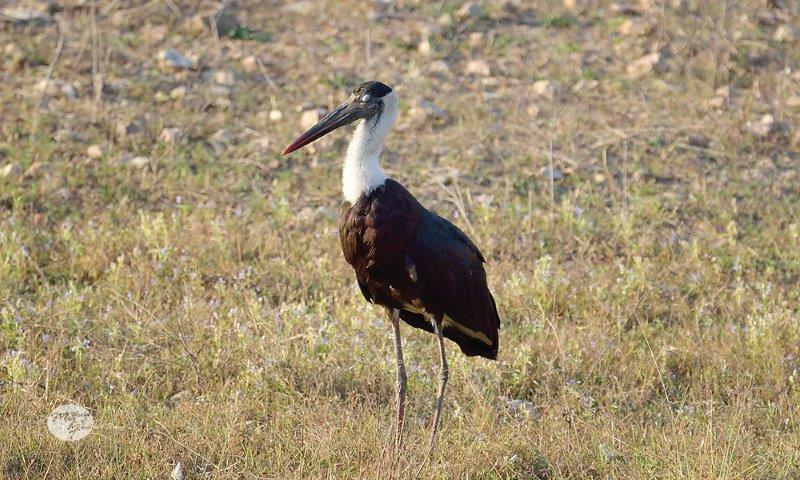 Hopefully, the birdlife here continues to flourish and continues to attract many more. § Best time to visit: March for Daroji bear sanctuary as that is the time one could sight bear cubs ride piggy back. For birding, preferably November to March. Flamingoes visit the area in March/April. Wow! Wow! Wow! Incredible captures and equally wonderful narration. My favourite was the Indian Rock Eagle Owl, it owns the space. What a personality. And the Grey Francolin pair was the cutest. Hi Sangeeta, Beautiful snaps and great article. We are planning a trip to hampi mid october with focus on birding. Can you kindly let me know how we can book a stay at Pompayya sirs homestay? A very nice post Sangeeta. I am planning a visit to Hampi next weekend and will hopefully be able to see the beauties that you have written about in your blog. Oh wow! I am sure you will have an unforgettable experience there - have fun!